This is not a bagel. Obwarzanek krakowski is found in bakeries or street carts, located at almost every corner, in Kraków, Poland. 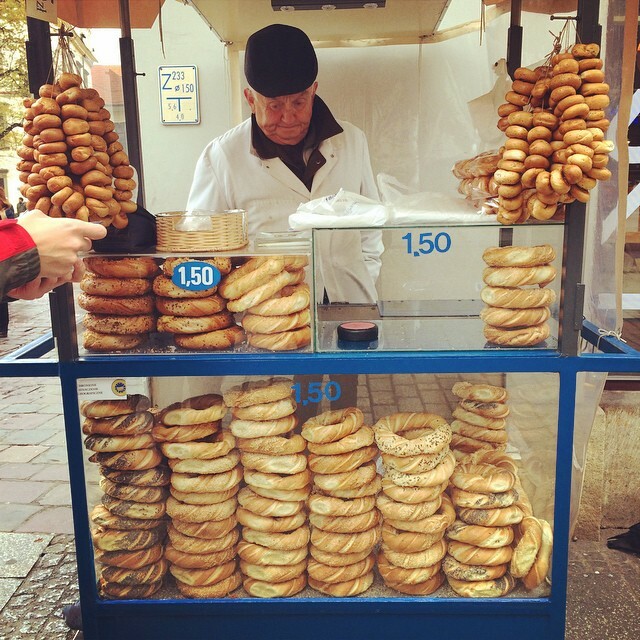 Obwarzneki are bigger than bagels, and are woven from two strands of dough, it is boiled before it is baked, and is sprinkled with poppy seeds, salt, herbs, sesame seeds, etc. Unlike the bagel, the obwarzanek is not sliced in half, toasted and schmeared with spread or made into a sandwich. One eats it as is. The best snack under $1 that one would ask for! OMG OMG OMG I want all of these obwarzanek krakowskis AND your gorgeous Lanvin bag!! How delicious to combine bread AND fashion? ?